Single Process Level Controller serves tank filling operations. Designed to complement Singer Single Solenoid Operated/Override Control Valves and sensor, LCP-TP provides gives option to control tank fill cycle as well as mechanically control valve while doing so as toÂ allow control of water in system. Unit is programmable with customized level control algorithms and offers local (interactive display)Â and remote (4–20 mA, Serial Modbus SCADA) control. Rated to IP67, UL-certified productÂ also integrates datalogging and trending features. 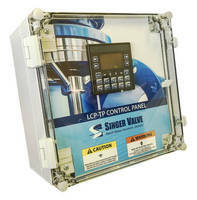 Surrey, BC - Singer Valve, a leading manufacturer of control valves has launched the LCP-TP Single Process Level Controller designed to complement Singer’s Single Solenoid Operated/Override Control Valves and sensor. Ryan Spooner, Instrumentation & Automation Manger for Singer Valve, said, “Pairing the Singer LCP-TP Control Panel and the Singer SC control valve gives the option to not only control the fill cycle of the tank but more functionality to mechanically control the valve while doing so, allowing control of the water in the system.” This combination package is ideal for filling any kind of tank with water that requires filling to a level setpoint and then drawing down the level of the tank to a secondary setpoint before activating the fill cycle again which ensures tank turn over. The LCP-TP Level Controller is programmed with customized level control algorithms and offers both local control via interactive display or remote control via 4-20mA or Serial Modbus SCADA communication. It has AC or DC external power options and contains 24VDC internal power supply for PLC and field sensor power. The LCP-TP has an IP 67 enclosure rating and is UL certified, built with surge protection as well as over circuit protection, which ensure protection of the main PLC during voltage spikes and surges. The LCP-TP is capable of On/Off level control using input from either level switches or 4-20mA level transmitters. It is equipped with data Logging and trending features which give ability to view live trending as well as store all data on a CSV file to be imported to a computer for full system analysis. Singer will showcase this latest innovation in electronic control panels at WEFTEC booth #7129. Since 1957 Singer Valve has been designing, manufacturing and distributing pilot operated diaphragm control valves. With innovative technologies, the company provides solutions for water loss management, water conservation and urban water and wastewater distribution throughout the world. By using quality materials and testing every valve and pilot before it is shipped, Singer Valve has an unprecedented track record for long lasting, easy to maintain solutions that work upon installation. Singer Valve’s electronic division provides instrumentation and control solutions to manage unique applications. For more information, go to www.singervalve.com.